History of Christian ethics: American Tract Society sheet instructing merchants in Christian practice. 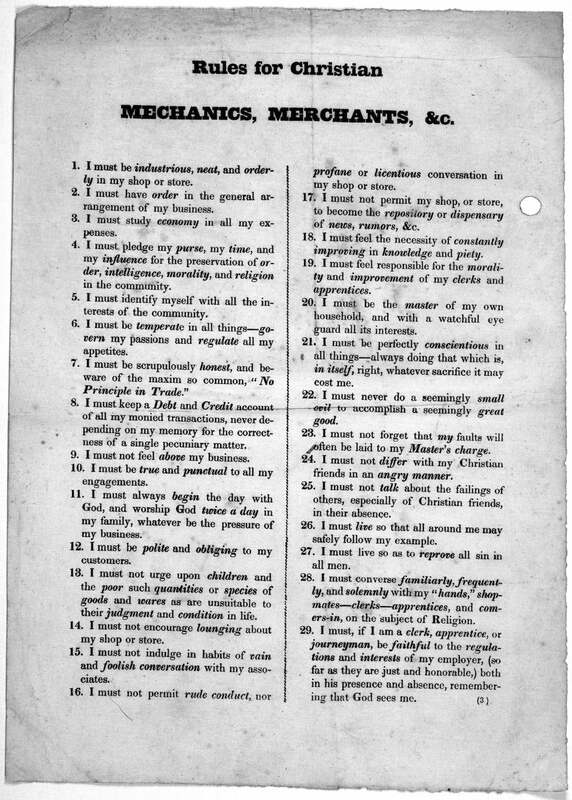 Literary historian Jane Tompkins writes that the society, which printed tracts for the use of evangelical Christians, was “the first organization in America to publish and distribute the printed word on a mass scale.” In the antebellum period, the ATS produced a cascade of pamphlets, books, and broadsides; this document was one of its shorter publications, a single sheet that could be displayed for reference in a workplace or home. Historian Lincoln Mullen, writing about common topics to be found in early 19th-century ATS publications, notes that the ATS “seems to have thought of its mission as being to edify Christians as much as to evangelize unbelievers.” These rules are written for merchants and mechanics who already believed and needed help applying those beliefs to business practices. Some of the recommendations—“I must keep a Debt and Credit account of all of my monied transactions, never depending on my memory for the correctness of a single pecuniary matter”—demonstrate the way this pragmatic advice merged with Christian principle. Click on the image below to reach a zoomable version, or visit the tract’s page in the Library of Congress’ digital archives.